The theoretical investigations and the thin films studies we carry out aim at contributing to the improvement of organic electronic devices. The third aspect of our activities is therefore to fabricate and test such devices, in particular OLEDs and OPVs, in order to exploit the results of the modeling and morphological studies. This is done with our facilities located at the Materia Nova Research Center, in close connexion with industrial partners. 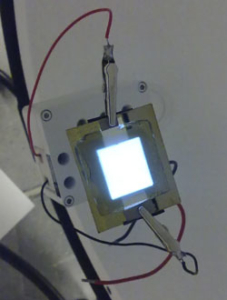 On one hand, the potential of novel luminescent materials and donor/acceptor molecular/polymer materials is evaluated in OLEDs and OPVs with ‘classical’ device architectures. On the other hand, new device architectures are designed and implemented for specific applications (e.g., lighting, microsystems,…). EfficientBulk Heterojunction Photovoltaic Cells with a Pre-OrganizedPoly(3-hexylthiophene) Phase. D.eMoerman, R. Lazzaroni, O. Douhéret. Applied PhysicsLetters 99 (2011) 093303. Large White Organic Light-EmittingDiode Lighting Panel on Metal Foils. P. Guaino, F. Maseri, R. Schutz, M. Hofmann, J. Birnstock, L. Avril,J.J. Pireaux, P. Viville, H. Kanaan, R. Lazzaroni, J. Loicq, F. Rotheudt, C.Pans. Journal of Photonics for Energy 1(2011) 011015. Ageing of Organic Photovoltaic Devices in Benin Environment(South-Sudanese Climate). M. Agbomahena, O.Douhéret, B. Kounouhewa, A. Vianou, N. Awanou, and R. Lazzaroni. SolarEnergy Materials & Solar Cells 117 (2013) 93-97.